After meandering for much of the week, U.S. stock markets jumped on a better-than-expected earnings report from money-center bank JPMorgan Chase. Added to a string of decent economic reports, it’s becoming clearer that the consumer remains in strong financial shape, inflation worries are premature and the overall economy is forging ahead. A recent survey shows that small business owners remain confident; they cite a dearth of skilled employees as the biggest problem they currently face. Job openings remain at elevated levels and workers know that their experience increases their value (read, paychecks) in a marketplace that’s tight on supply and high on demand. With the number of Americans filing for unemployment benefits hitting a nearly 50-year low this week, fears of an imminent recession seem far-fetched. For the year through Thursday, the Dow Jones Industrial Average and the broader S&P 500 have returned 12.8% and 15.9%, respectively. The MSCI EAFE index, a measure of developed international stock markets, is up 12.1%. As of Thursday, the yield on the Bloomberg Barclays U.S. Aggregate Bond index has dropped to 2.99% from 3.28% at 2018’s end. On a total return basis, the U.S. bond market has gained 2.7% for the year. Like so many horror movie franchises, Brexit keeps returning with yet another sequel in the series. In the latest ghoulish twist, European Union leaders extended an April 12 deadline for the U.K.’s exit six months to Halloween. In trying to extricate itself from the E.U., the overarching question remains whether British politicians can slay the demon of political gridlock before October 31. Stay tuned. While the Brexit snafu persists, there’s renewed optimism that the U.S.-China trade accord is progressing. We’ll see if the deal has a meaningful impact on trade, but unless there are concrete steps taken to protect intellectual property, we think any “agreement” will be short on substance and long on rhetoric. Brexit and the U.S.-China trade dispute have dominated headlines for months and have remained atop the list of reasons many pundits and investors give for avoiding the stock market. And yet: Which well-known developed foreign market was one of the best performers (from a dollar perspective) in the first quarter? And which very prominent emerging market was one of the best in the year’s first three months, again from the perspective of investors like you and us? If you said the U.K. (up 11.9%) and China (up 17.7%), you’re right! It’s yet another object lesson why headline risks don’t always translate into market risks. First-quarter earnings reporting season began in earnest today. As happens every three months, corporate leaders reveal how their companies performed during the prior calendar quarter while giving hints about expectations for the months ahead. You may hear the term “earnings recession” thrown around by the financial press in the days and weeks to come. It’s important to put that term and others like it in perspective. The earnings recession that analysts are talking about reflects the fact that earnings growth during the first quarter was negative, meaning companies did not earn as much this past quarter as they did in the first quarter of 2018. Earnings themselves won’t be negative—companies are still very much in the black, it’s just that the comparison between the two periods was negative. Think back to a year ago, when 2018 first-quarter earnings were being compared to first-quarter earnings for 2017. We saw a huge leap—about 20% to 25%—as the 2018 tax cuts caffeinated growth. Now those sky-high 20%-plus results are coming back to Earth in 2019—the longest government shutdown in history, which hurt growth in the first quarter, isn’t helping matters. Even if the numbers slip a bit this quarter, earnings are still expected to grow over the course of 2019. Suppose, for example, that you owned a grocery store that earned $1 million over the first three months of 2017. The next year, your profits jumped to $1.2 million in the first quarter as tax cuts went into effect. You were surely excited, but at the same time you probably doubted you’d see your profits jump another 20% from there. Now it’s April 2019 and as you run the numbers for this year’s first quarter, your profits came in at $1.1 million; down from 2018 but still up $100,000 from the same period in 2017. Disappointing perhaps, but it doesn’t mean that you won’t increase your profits over 2018 by the end of the year—it’s simply one quarter’s results. On a broader scale, that’s what we’re facing when it comes to the overall U.S. economy and the stock market, where prices are often calculated and calibrated based on profits earned by the companies in that market. 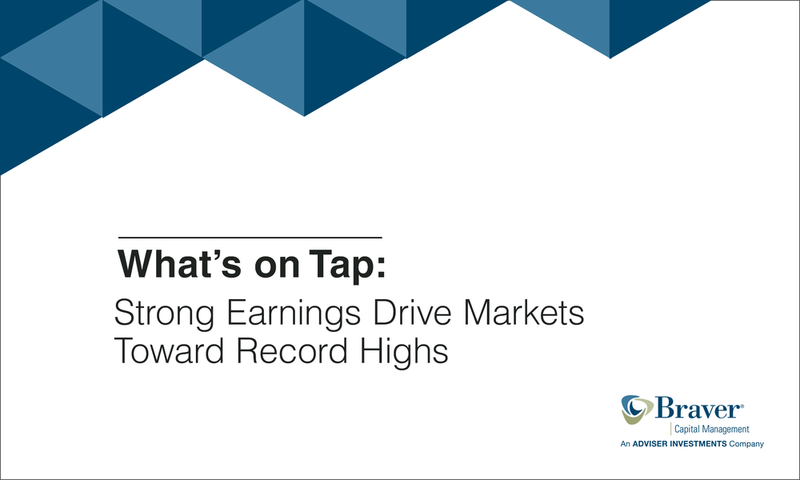 Earnings may be lower than they were a year ago, but they are higher than they were two years before and should continue to grow over the course of the year. Traders might whipsaw the stock market on every nuance of change in the earnings numbers, but for investors with long time horizons that’s not a sound strategy. Did you receive a tax refund this year? If so, we have some ideas about what to do with it. We also have some thoughts for those of you who didn’t get a check from the tax-man. 1. Add to your emergency fund. Do you have ample savings to pay for an unexpected large expense without having to sell any investments? Topping up your rainy-day fund is one option for that refund check. 2. Invest in your retirement. You have until Monday, April 15 to max out your 2018 retirement account contributions. Then, get a head start on your 2019 contributions. 3. Check your debt. Consider making a lump sum payment to reduce the balance on any high-interest debt you are carrying. 4. Do some good. An unexpected tax refund might be just the ticket for giving to a charity you’re passionate about. 5. Have some fun! Give yourself permission to splurge, especially if your savings are in good shape. If you didn’t receive a refund and owed more than you expected to, now’s a good time to assess your tax withholdings. On the other hand, if your refund at the end of the year was exorbitantly large, you’re probably paying too much in taxes throughout the year. In either situation, if you’re still working, you should ask your human resources or payroll department about reviewing your Form W-4. If you’re retired, a big refund or outsized tax bill might mean a chat with a tax professional is in order. Economic data will take a back seat to first-quarter earnings reports next week, but we’ll still get useful reads on manufacturing, homebuilders’ confidence, new home construction and permits, leading indicators and retail sales, as well as the Federal Reserve’s Beige Book of anecdotal reports from around the nation. Among those companies scheduled to report earnings, we’ll be most closely watching Citigroup, Charles Schwab, Goldman Sachs, JB Hunt, M&T Bank, Bank of America, BlackRock, CSX, Johnson & Johnson, Netflix, Abbott Labs, Alcoa, Bank of New York, E*Trade, Morgan Stanley, United Rentals and American Express. Technology companies report earnings the following week, meaning that within two weeks we should be able to call the earnings trend. You’ll be the first to know. Please note: This update was prepared on Friday, April 12, 2019, prior to the market’s close.